With GGP membership you will be contributing to a more sustainable future via our world of gardening. As a GGP member you will also have access to the following member benefits. 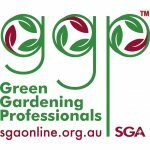 Becoming a professional member of our GGP program is easy. Fill out the application form below and you will be directed to make your payment of the annual membership fee of $85 (per financial year) by PayPal. Business Membership – Please let us know if you’d like to discuss a Business Membership package for you and your staff. Student Membership – We are now offering Student Membership. A great way to improve your skills and knowledge, and meet others in the industry. To read more and join click here. Contact us at professionals@sgaonline.org.au for more info. *please note that GGP members are members of SGA’s industry program, and are not general or voting members of SGA. What areas of sustainable gardening would you like to learn more about? Are you the business owner or employee?